The eShakti Feminine Pleated Knit dress. When eShakti contacted me, asking if I wanted to select an item from their line to review, I couldn’t resist after I saw everything they had to offer. From their extensive collection I chose the Feminine Pleated Knit dress in navy. It’s exactly the kind of dress I’ve been looking for to wear in summer and in one of my favorite colors too. eShakti allows you to customize your design choices to an amazing degree—sleeve type, dress length, and neckline, all to your liking, and you can choose to add pockets or not as well. What an impressive selling point! I kept the dress pretty true to its original design—cap sleeves, below knee-length—and only removed the pockets. Bodice details. J. Crew necklace, L’Wren Scott sunglasses. The dress arrived in about a week and a half and fit like a dream. It reminds me of something Kate, the Duchess of Cambridge, would wear, which was what I had in mind when I selected it. I paired it with a pair of Kelly & Katie metallic strap wedges and a lilac J. Crew cardigan, crystal baguette necklace and Farmer’s Market tote. I think Kate would approve! I love the high collar of the dress, the wide-banded empire waist, the cap sleeves and the full skirt, which caught in the wind and blew it to the side, giving me a fun Marilyn Monroe moment. Looking through my J. Crew Farmer’s Market tote. The dress is incredibly well-made and sturdy and the knit is heavy-duty and machine-washable—this is not a dress that’s going to fall apart after a couple of washes. 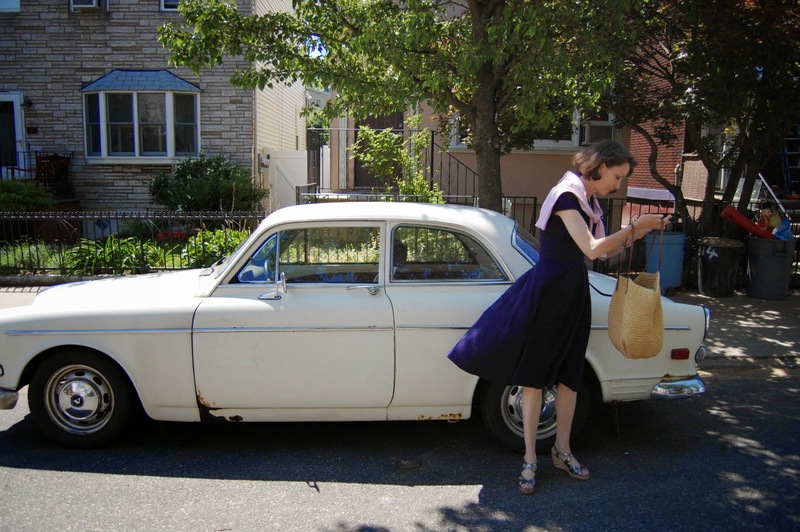 This particular dress ended up being perfect for “How I Wear My: Pastel” especially since I found a white vintage Volvo—which I have since learned is a 1964 122S—to pose in front of on the streets of Brooklyn. 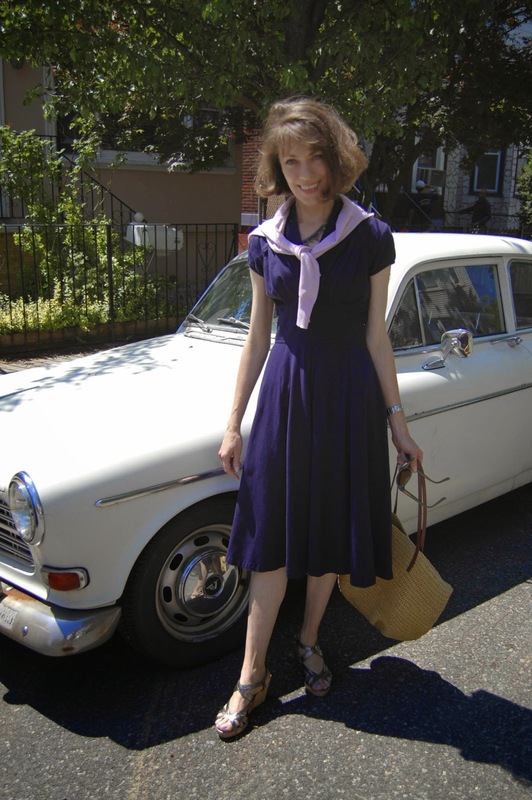 The dress definitely has a retro feel to it so this pairing of car and dress was spot on! If you are in the market for a summer dress (or blouse or skirt), take a look at eShakti’s website. eShakti is known for their customization and it’s the closest thing to either sewing your own clothes or having a seamstress make a dress for you. I highly recommend this site! eShakti is offering 10% off to readers of Everything Just So until June 20, 2014 with the code ETJES at checkout in the promotional code box. Do note that it is not case-sensitive and can be used any number of times until June 20, 2014. Not valid on previous sales or clearance, sale or overstock items, or on gift cards. Disclosure: eShakti sent me the Feminine Pleated Knit dress to review. All opinions are my own. Jill, the dress is beautiful and it looks perfect on you. I am sure Kate will approve too!!! Oh it looks fabulous! It's such a beautiful shape, the perfect summer dress. I love this photo shoot Jill...you look amazing in this dress! What a great look for you! I definitely need to check out that website! This shape dress would be a flattering one for me, I think. Love this photo shoot. What's cooler than a classic car as an accessory? !